The editorial board of Odessa magazine “Delovaya sreda”, Television Informational Agency “Vikna-Odessa”, and Odessa Cartoonists’ Association have hold the “Tourism and Traveling” International Cartoon Contest. 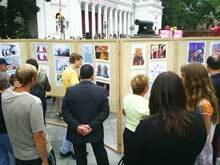 The exhibition of pictures forwarded to the contest took place not far from the Odessa city council building during the City Day, on September 2, 2009. Tens of thousands of Odessites, guests of the city, including over 30 delegations from the countries all over the world, could see the exposition. The jury including Valeriy Khait, editor-in-chief of the “Fontan” humorous magazine; Tatyana Belokonenko (Israel, Haifa) — artist, cartoonist; Eugene Volokin, director of the “Vikna-Odesa” Informational Agency; Peter Siguta, editor-in-chief of the “Delovaya sreda” magazine, chairman of the Odessa Cartoonists’ Association, distincted prizewinners on September 8, 2009. The 1st prize – Yuri KOSOBUKIN (Ukraine) — $500. Julian PENA-PAI (Romania) ($150), Sergey TUNIN (Russia) ($150) shared the 2nd prize ($300). The 3rd prize was divided between Jordan POP ILIEV (Macedonia) ($100), Oleg LOKTEV (Russia) ($100), Konstantin KAZANCHEV (Ukraine) ($100). Editorship of Odessa magazine «Delovaya Sreda», Odessa Cartoonists’ Association and «Vikna-Odessa» Informational Agency announce of International Cartoon Contest named TOURISM & TRAVEL. PICTURES FORWARDED TO THE TOURISM & TRAVEL CARTOON CONTEST ARE HERE. Located at the Black Sea coast Odessa City is a center of international and Ukrainian tourism. Mild climate, plenty of sun, cozy beaches make this city being a center of tourism. Multinationality of Odessa and tolerance of Odessa citizens have created a specific sense of humor. The theme of contest is «Tourism & Travel». Events, people, nature, architecture can be reflected in humorous manner, possibly with Russian or English inscriptions. 1) Every cartoonist can participate in the contest. 2) Cartoons (electronic copies) can be performed in any technique. Number of cartoons are limited to seven. Cartoons awarded at other cartoon contests can also participate. 3) Deadline of works reception – August 28, 2009. 5) Works have to send by e-mail and should have 300 dpi resolution, А4 size in JPEG format of 2 Mb maximum. 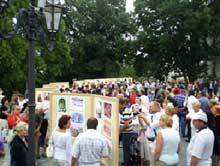 6) Summary and announcement of the winner would take place within the framework of holiday events dedicated to Odessa City Day – September 2, 2009. An institution of special prizes from the sponsors of International Cartoon Contest Odessa-2009 «Tourism & Travel»» is also possible. Works sent to the contest can be used by the founders for production of promotional materials and for the broadcast in internet. Each cartoon is to be sent by a separate message with the inquiry form of the artist, address, e-mail address and author’s photo attached to.